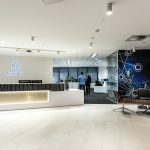 The IA Design team were appointed by Network Ten to design their new office fit-out, servicing all studio departments from back-of-house journalism through to on-air production. The Network Ten project included numerous specialised areas, all of which needed to be catered for in the design. The workflow of news and information arriving, progressing to production in voice over and edit suites, through to the point where the news is presented on-air had to be supported. In addition, how on-air talent arrive and move from front of house to wardrobe and makeup and finally into the studios also needed to be considered in the design. The design process was heavily focused on space planning, acoustic engineering and circulation to ensure all workflows were accommodated. Special consideration was given to the acoustic requirements of the fit-out, implementing a highly specialised technical system within the interior architecture, integrating these requirements seamlessly within the project budget and program. The end result is a sophisticated and creative working environment that has improved the processes and workflows for the Network Ten departments. 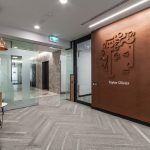 IA Design acted as lead design consultant, providing the interior design and documentation under the direction of an independent project manager. IA were appointed in February 2016, followed by the briefing stage in March, design development in May, tender and documentation in June, appointed head contractor in July, construction from July to November, and project completion in December.